I finally finished up the swatches from this collection, and I'm pretty happy with all of them. I posted Daisy Dweller (the yellow glitter) a few days ago, and that was the only one that I wasn't thrilled with, because it just doesn't seem to work with my skin tone. But it redeemed itself as a layering polish, and I think this is a lovely collection for Spring. I used 3 coats on the glitters and 2 on the lone creme in this collection, Beetle Bailey. The glitters in this collection are a little sheer, but they dry quickly and I just prefer the look of 3 coats to 2 on these shades. 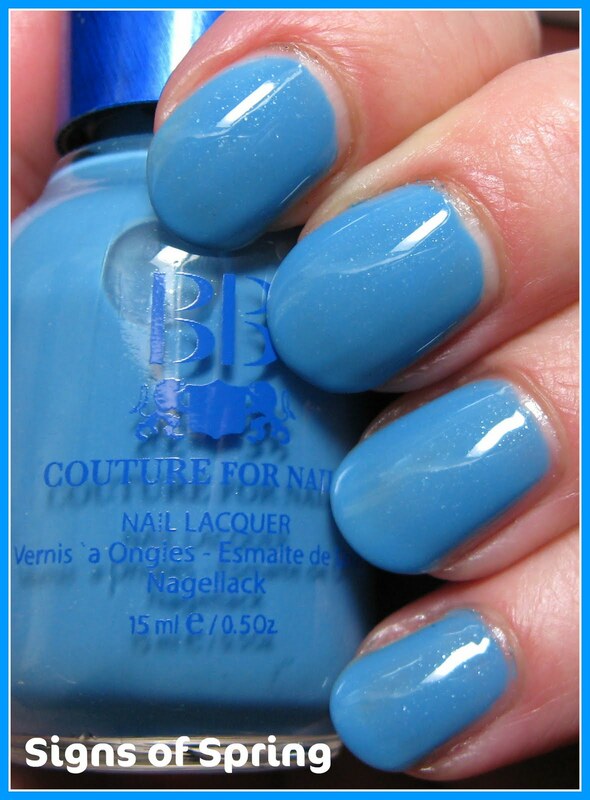 I absolutely adore Man Bug--the name alone is enough to buy it, but the shade, a darker seafoam green, is just beautiful. I was also particularly taken with Love Bug, a very delicate bubblegum pink shade. The glitter in this one seems to change color quite a bit more than the others. Beetle Bailey is a darker lavender--not too dark, but not what I would consider a pastel exactly. I've always loved the way BB Couture polishes apply, especially their cremes, and this one was no exception. 2 coats and no streaks. Signs of Spring is not quite as bright as it's showing in my photo, but to me, it's almost a cornflower blue, and very pretty. Speaking of signs of spring, my husband decided to take the day off so we could do some yard work. Nothing like taking a day off to work, but that's my husband (I'm most definitely the lazy one!). He's cutting into my swatching time, you know. But it was a productive day and we picked up a peach tree and 2 plum trees to add to our mini orchard, ordered a dwarf weeping cherry tree, which I've always wanted, and did some weeding and fertilizing. Then he decided we should go looking for doors and we ended up getting exactly what we wanted. The new front door is green, and the storm door has taupe trim. And of course all I kept thinking about, was how it matches NARS Zulu and so many of the taupe polishes in my collection! Oooh, I LOVE Man Bug! These are all so adorable and spring but they have more oomph behind them than usual pastels! Man bug is purrty. I like daisy dweller too. I have such a long wish list of BBs. They are so good that once you try them you want more and then they keep making more and more wonderful colors. Would like to see pictures of your mini orchard. LOVE! my wish list is getting longer with them as well! Am loving Beatle Bailey and Love Bug. What fun colors! Mary your a riot! I thought I read somewhere that Nars was supposed to re-release Zulu. Know anything about that? I love fruit trees. When I lived at home we had a peach tree and the peaches were out of this world sweet and juicy. Never tasted anything better! We also had a cherry tree and it was awful hard to get the cherries. The birds were there when they were just ripe. Nothing you did would get rid of them. Your yard sounds like it's going to be even more spectacular. I don't blame you and your husband for doing all that work after the awful winter you've had. Hope all comes up beautifully and you show pictures. Thanks so much for swatching all those polishes. I know I definitely want Love Bug! your nails are looking sooo good mary!! I agree with you - the name alone is enough to buy that one! Jessica~it is nice to have them. I get so excited when they finally start to have fruit! Angie~I agree, the glitter definitely adds to the pastel nature of them. Elizabeth~I'm going to try Daisy Dweller over white. I really want a nice yellow, but I think it's my skin tone rather than the polish that's giving me problems. SilhouetteScreams~it's a pretty shade, and I like that it's a bit darker than most of my others in this color family. 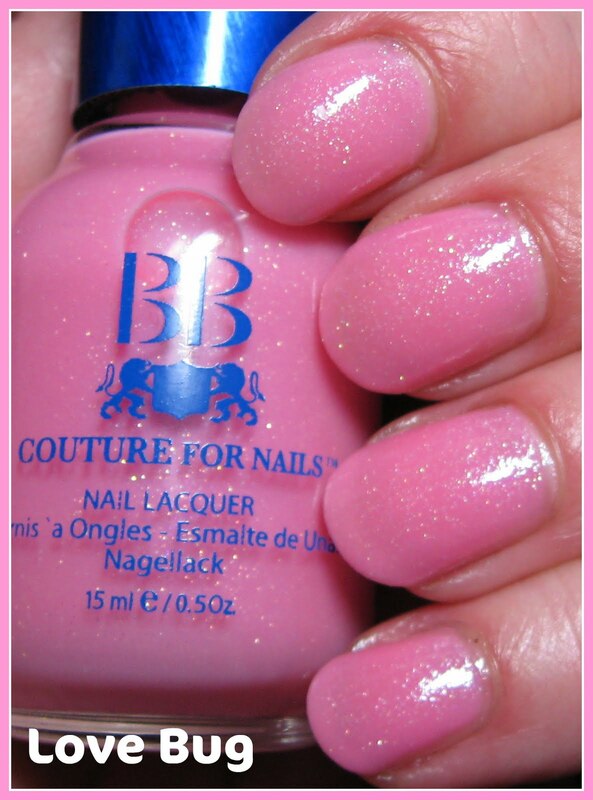 peripatetic33~I adore BB Couture polishes, and agree that they come out with many totally unique shades. I'll have to see about taking some pictures of the little trees! NY*NAIL*DIVA~the list never stops growing, does it?!! Lucy~yes, I heard it's being re-released in the Fall. It's enjoyable doing yardwork, especially when everything starts to bloom and grow each year. Man Bug is a must-have! Brooke~I guess it's the oppoosite of Lady Bug, I'm not sure! But it's a beautiful shade.